I have tasted this wine in a wine tasting organized by one of my favourite wine handler in my town, AixVinum (www.aixvinum.de). And like always, it was really difficult to really examine all the element of a good wine, which it deserves, in such an occasion. Especially when you were faced with 40 to 50 bottles of delicious wines. So what I normally do is to identify which wine I like and bought it home to reconfirm it later. Judging the wines using only my guts or Bauchgefühl. Just like what Philipp Kuhn use to paint his wines. 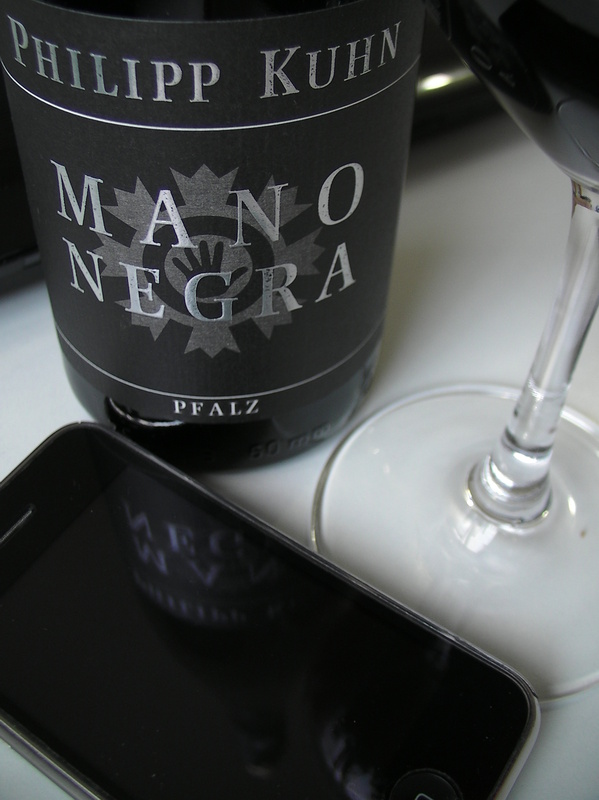 Mano Negra means black hand in english and stands for the black hands the winemaker gets from making this wine. This is a red cuvee made from Cabernet Sauvignon and Blaufränkisch aged in oak. Both are not typical in Germany, the former is well-known world-wide, while the latter is typically found in Austria. Surely you cannot find such a cuvee so often. The color is dark reddish violet. The nose is round, soft and refreshing with intense sweet fruit; cassis, raspberry, cherry and blueberry, complemented by spice, pepper, coffee bean and sweet vanilla. A really friendly nose that comforts you. In the mouth, penetrating acid balanced out by multilayered sweet fruit; ripe cherry and blueberry, made more complex by hints of coffee bean, spice and vanilla. The texture is light, smooth and round. Great and enjoyable balance, with good smoothing finish. This is a really charming and easy-to-drink wine, with just enough elements to keep you interested without being too serious. What I like is the play and balance between two grape; dark heavy Cab versus refreshing Blaufränkisch. And all this is made more fun by the oaky elements. I had this wine after a really tired week and it simply cheered me up. It was just like talking to your close friends on a big soft sofa in a lazy afternoon. Have you ever try the incognito red from Kuhn? Yes. It’s the entry level red wine from Kuhn and really enjoyable. He is one of my favorite. His Rieslings are also very good.